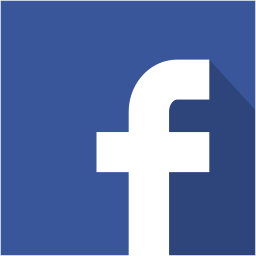 Hundreds data points are automatically digitized in a second. 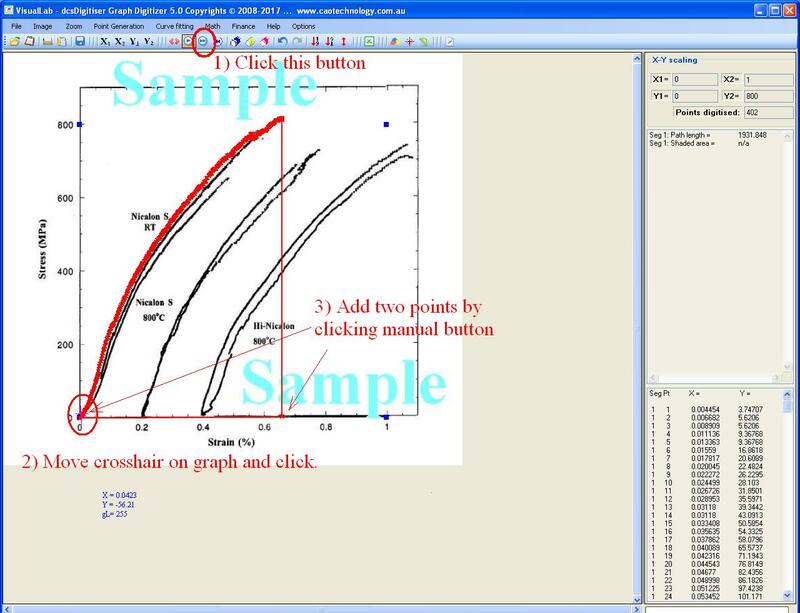 2) move crosshair on graph and click, done! 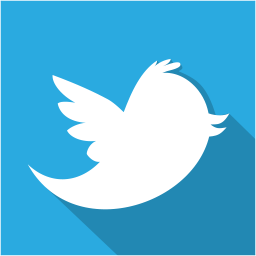 A free trial can be carried out instantly for free by clicking the naviation bar on the top "Free Trial / Order". 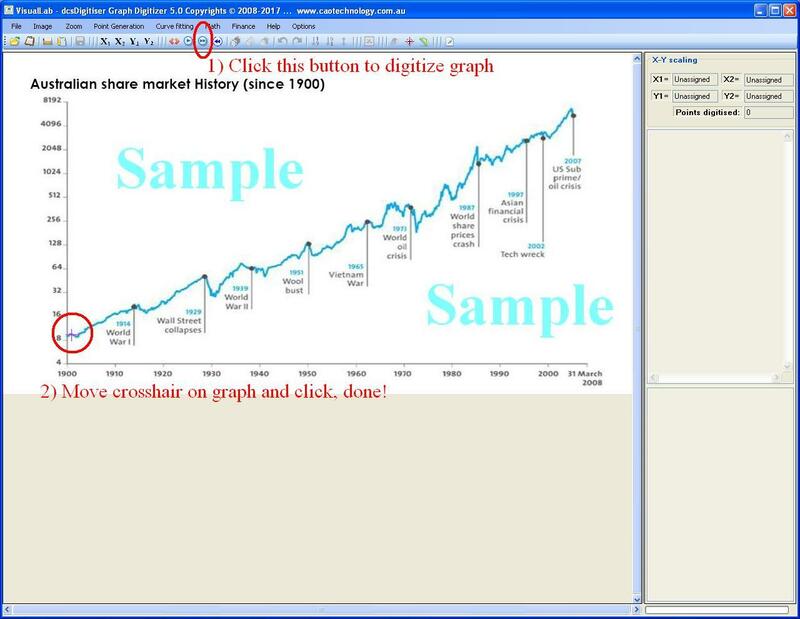 Example 1: To digitize a graph of Australian share market history, simply 1) click the digitizing tool button, 2) move crosshair over the graph and click. 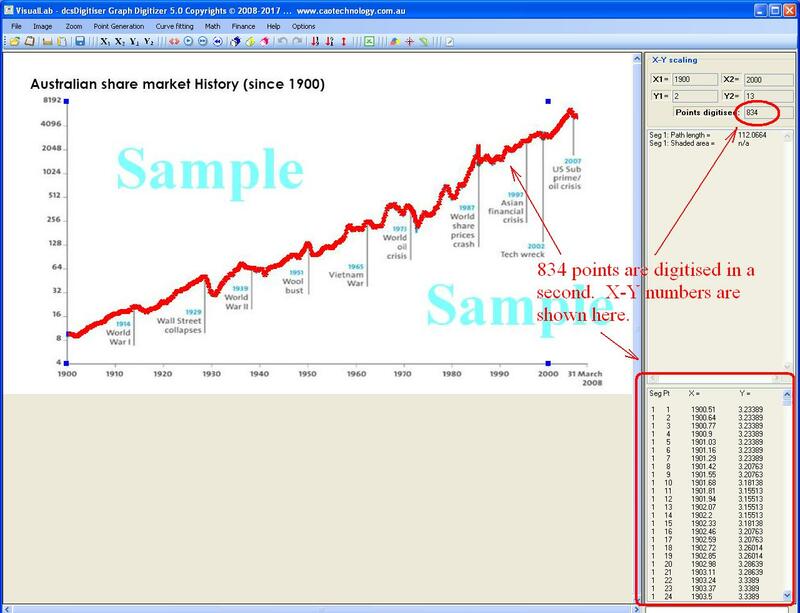 Example 2: The graph of Australian Share Market History is then automatically digitized to obtain 830 x-y numbers. Example 3: click Cruve fitting and chose a polynominal function, the digitized graph is curve fitted as shown is the following figure. Example 4: A strain-stress curve for mechanical testing of an alloy is simply digitized. 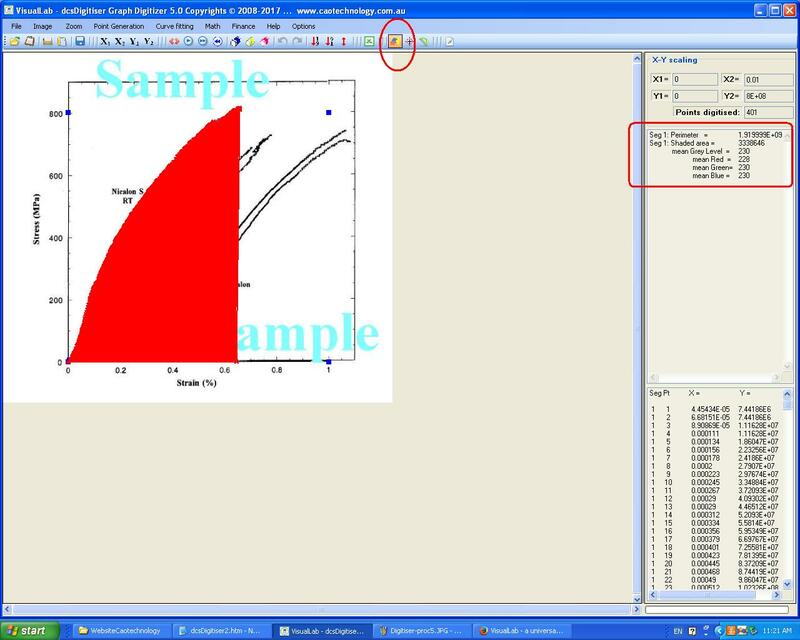 To calculate the work for breaking the testing specimen, two more points are added by clicking on the graph. 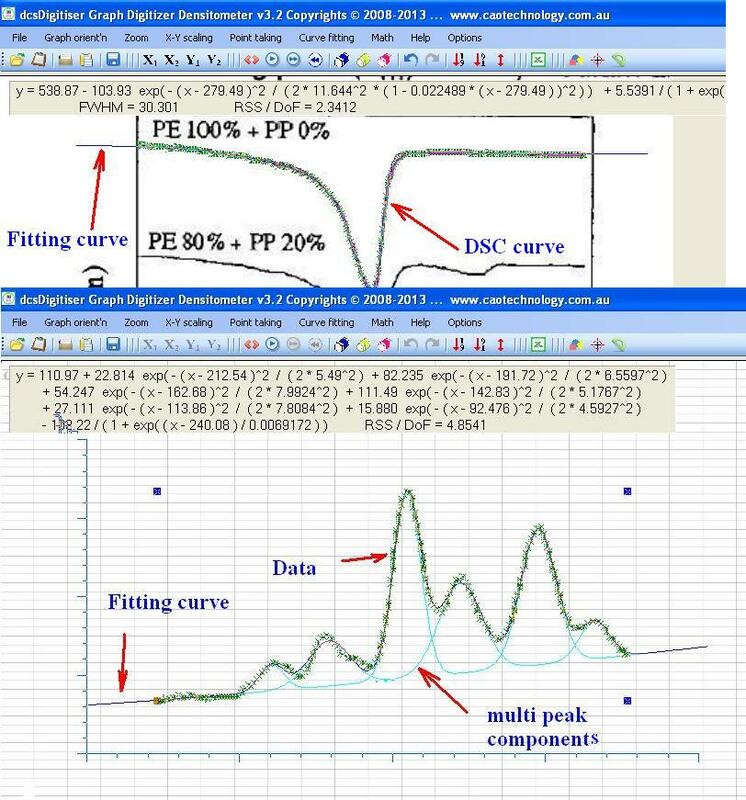 Example 6: A single peak DSC curve is digitised and its equation is obtained by curving fitting; X-Y numbers of a multiple peak curve is imported to VisualLab - dcsDigitiser, the curve is then fitted by curve fitting to obtain the eqution: its multiple components are deconvoluted. 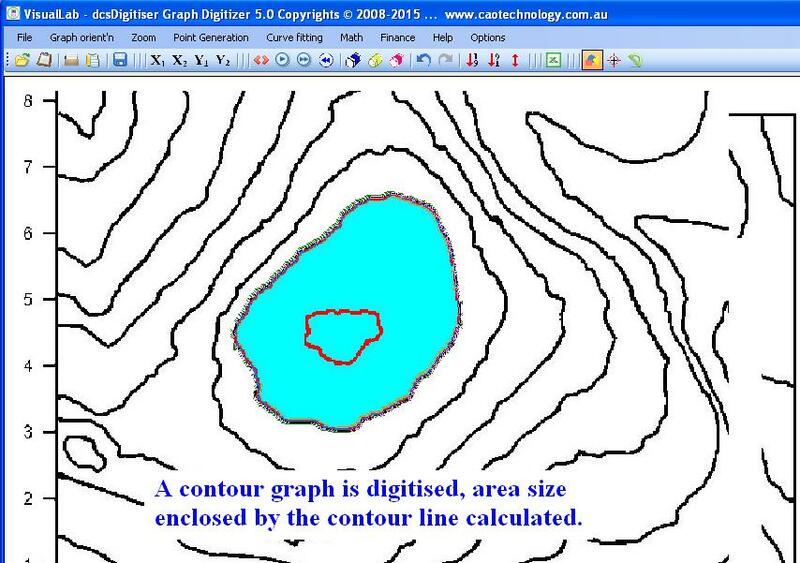 Example 7: Simply by a few clicks, VisualLab-dcsDigitiser ditigises a contour line. 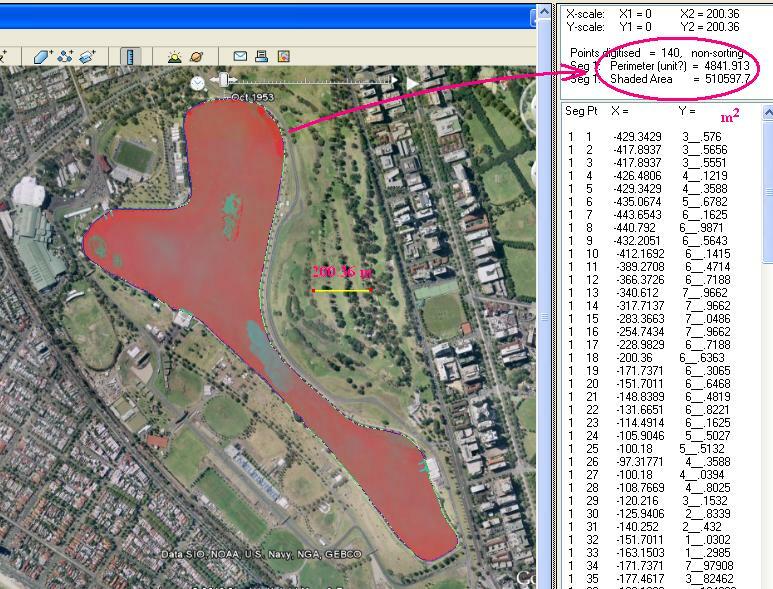 The area size enclosed by the contour line is then calculated by a click. 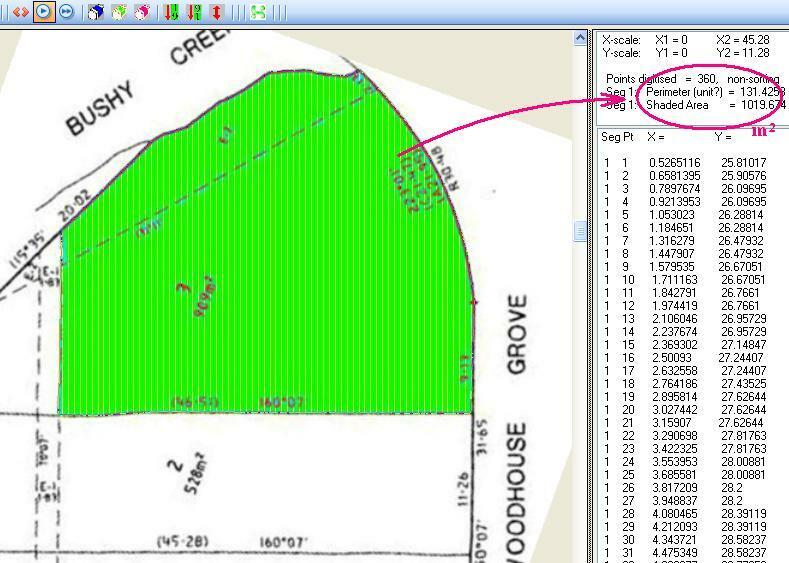 Example 8: VisualLab digitizes a drawing with irregrular boundaries, and calculates the area size enclosed inside. 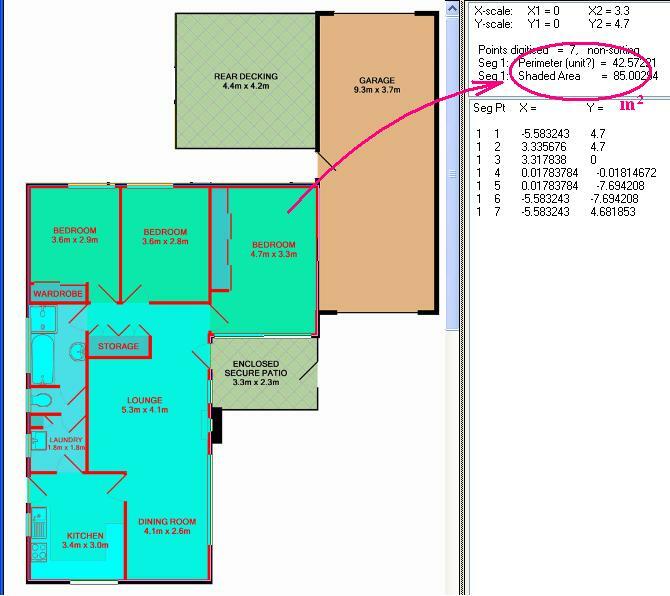 Example 9: VisualLab measures the area size enclosed inside for a civic drawing of building plan. 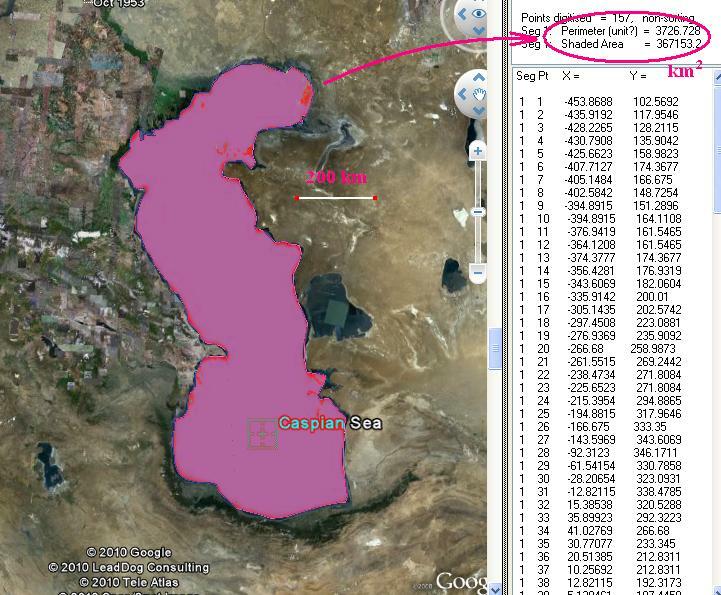 Example 10: Google Earth satellite photo of the Caspian Sea was copied and pasted to dcsDigitiser, with a scale bar of 200 km being attached. The coast line of the Caspian Sea was then manually clicked against the photo. When the distance between the first-last points is close enough, dcsDigitiser automatically calculates the area and perimeter of Caspian Sea, being around 367,153 km2 and 3,727 km, respectively (no curvature of the Earth ground surface has been taken into consideration in this case). 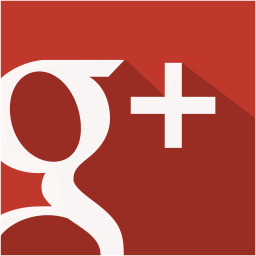 Example 11: Formula 1 Qantas Australia Grand Prix car racing is held along the Albert Lake in Melbourne. The lake's area size and circumference are: 510,598 m2 and 4842 m respectively. 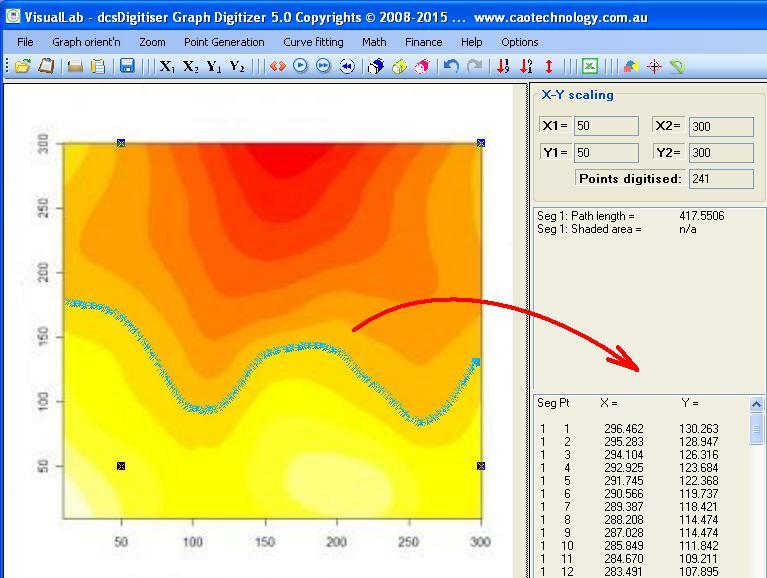 Example 12: VisualLab find the line with equal color for a contour graph. Example 13: VisualLab - dcsDigitiser can be used for gel analysis as well: Both novelist Brown and historian Hart are interested in reviewing the forensic records of Mr. Kennedy's assassination, and have the hair DNA testing results of 4 then suspects in hand. 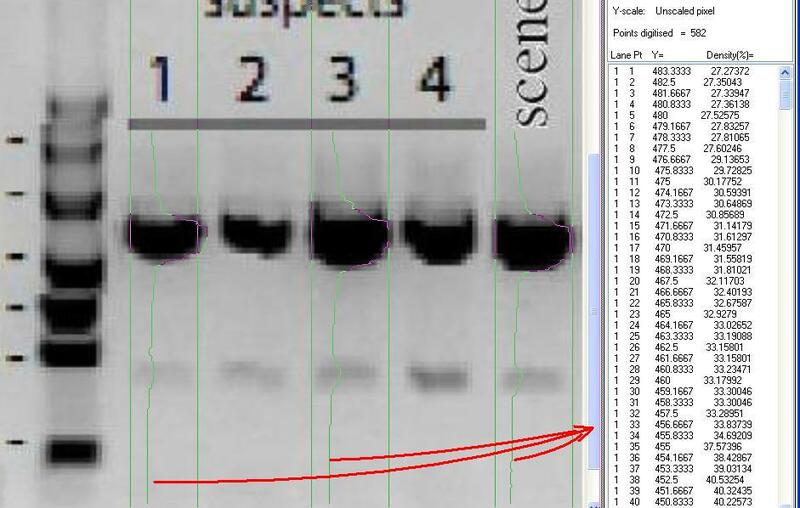 Using dcsDigitiser, Brown and Hart digitized the hair DNA gel and obtained numerical density profiles for peer analysis by their own eyes, which are often, though not always, sharper than that of CIA and FBI detectives. 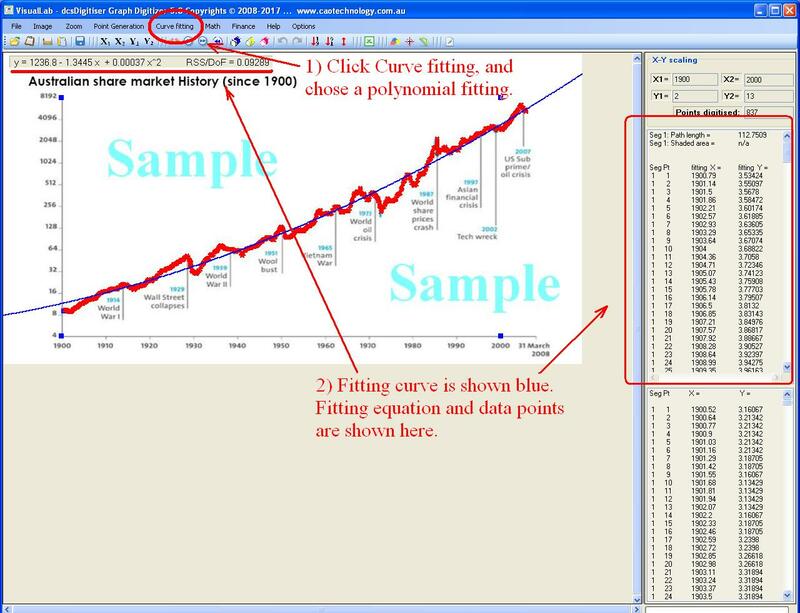 To visit DSC Curve Solutions (DCS ®) and non-isothemal kinetics, click links shown in naviation bar.